Our local playhouse has embraced the idea of building community for several years now by opening some summer performances to local organizations for fundraising. So for the upcoming performance, Team Aidan is partnering with the Hackmatack Playhouse to get Aidan rolling into his van. 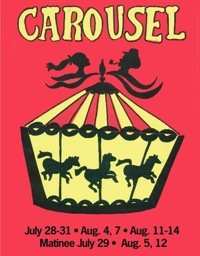 Buy a ticket from Team Aidan for an 8pm performance of Carousel on August 12 and Team Aidan gets part of the proceeds. Tickets are $22 and can be purchased by contacting us. Carousel is a Rodgers and Hammerstein musical which features songs such as “If I Loved You” and “You’ll Never Walk Alone.” So enjoy yourselves, contribute to a great cause, and go home humming.